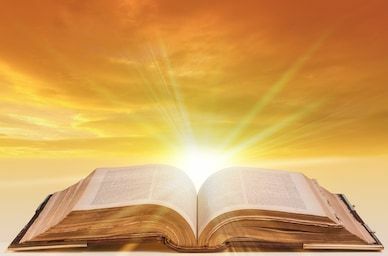 The Bible contains sixty-six books, written by forty authors, covering a period of approximately sixteen hundred years. The word “Bible” comes from the Greek word [biblos], meaning “book”. The word “testament” means covenant or agreement. God made an agreement based on law (Deut. 4:5) – called the Old Testament – regarding man’s salvation before Christ came. God’s new agreement, or Testament, was a Covenant of Grace (Gal. 3:17-25) & describes man’s salvation after Christ came. Jesus quoted from twenty-two Old Testament books. The book of Hebrews quotes the Old Testament eighty-five times. Revelation quotes the Old Testament 245 times. The longest chapter in the Bible is Psalm 119 (176 verses). The shortest chapter is Psalm 117 (two verses). The longest verse in the Bible is found in Esther 8:9 (more than ninety words). Shortest verse: John 11:35 (two words). The longest book in the Old Testament: Psalms (150 chapters). The shortest book in the Old Testament: Obadiah (21 verses). The shortest book in the New Testament: 2 John (13 verses). The oddest verse in the Bible – 1 Chronicles 26:18! (Look it up in the KJV of the Bible). Other than the word “the”, the word most often used in the Bible is “Lord”. Jonath-Elem-Rechokim (Ps. 56) means “a silent dove of far-off lands” (distant oaks). Maher-Shalal-Hash-Baz (Isa. 8:1)- the name of Isaiah’s son; means “quick to the plunder, swift to spoil”. The shortest prayer in the Bible: “Lord, save me!” – when Peter was walking on the water and became afraid. Jesus’ high priestly prayer (John 17). The time of Jesus’ return (Mt. 24:36). How God’s sovereignty works (Rom. 11:33-36). How the relationship between Father, Son & Holy Spirit works in the Trinity. The writer of the book of Hebrews. God – unless we first know His Son, Jesus Christ. The hairiest men in the Bible: Esau (Genesis 27:11-23); Samson (Judges 16:17); Absalom (2 Samuel 14:26); Elijah (2 Kings 1:8); King Nebuchadnezzar (Daniel 4:33); John the Baptist (Luke 1:15). Joshua 10:12-13… It stood still as Israel fought against the Amorites. 2 Kings 20:8-11… It changed directions as a sign to King Hezekiah. A man was raised from the dead when his body touched Elisha’s bones (2 Kings 13:20-21)… to be continued. * One who was raised by Himself… Jesus rose from the dead (Matthew 28:5-9; Mark 16:6; Luke 24:5-6 – and unlike any of the others listed before… He never died again! Enoch lived 365 years & then was taken up to be with God (Genesis 5:23-24; Hebrews 11:5). Elijah was carried by a whirlwind into Heaven (2 Kings 2:11). 1. Sarah, Abraham’s wife, 56 times. 2. Rachel, Jacob’s second wife, 47 times. 3. Leah, Jacob’s first wife, 34 times. 4. Rebekah, Isaac’s wife, 31 times. 5. Jezebel, wicked queen and King Ahab’s wife, 23 times. 6. Mary, Jesus’ mother, 19 times. 7. Abigail (Nabal’s and King David’s wife), 15 times. 8. Miriam (Moses and Aaron’s sister), 15 times. 9. Mary Magdalene (Jesus’ friend), 14 times. 10. Hagar (Abrahams’ concubine), 14 times. Eve, the mother of the human race is mentioned only 4 times.